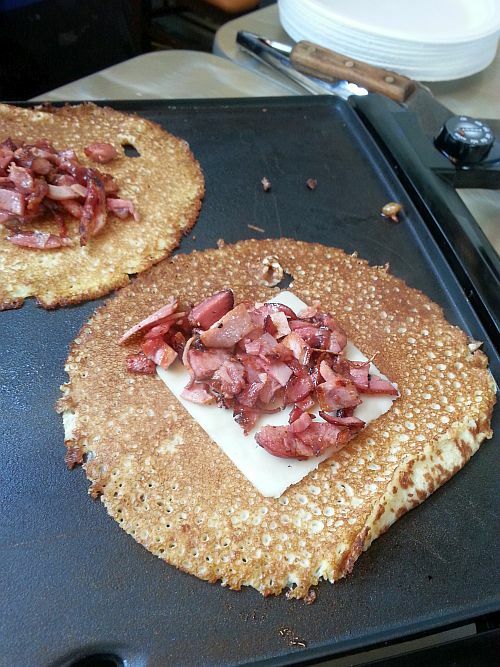 How Was Vancouver Foodsters Culinary Scavenger Hunt? Have you ever been on a scavenger hunt? It has been a long time for me, but on Sunday April 6, Vancouver Foodster had his inaugural Culinary Scavenger Hunt in downtown Vancouver. We had to visit 9 different restaurants and do or get something as outlined on our clue sheet, then bring it back to the start. Everyone that completed the tasks would be entered for a draw to win fabulous prizes (BTW, I did not win any prizes. Just attending is a prize for me!) The event is very similar to Vancouver Foodster’s Tasting Plates, in that you get to sample some small dish at each restaurant, but you also have this additional fun component. Some of the tasks would be for example, to get the Take Out menu from a particular restaurant, or to get your picture taken with a server at a restaurant. 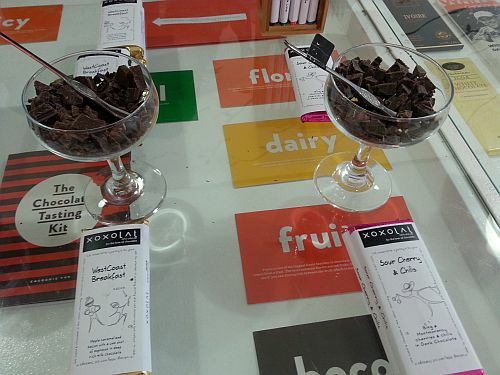 XOXOLAT – How can you go wrong with hand-made chocolates? We were treated to a flight of chocolates; some were straight dark chocolate, while others were mixed with other ingredients, like Nacho Chips & Lime or Sour Cherries and Chilies. I really like this store and with their range of chocolates I am sure everyone will find something they would enjoy. 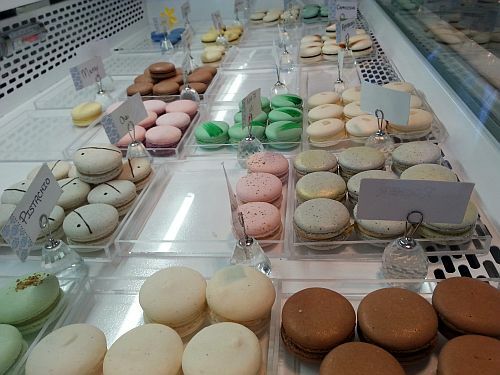 Soirette Macarons & Tea – Macarons are hard to pass up. They are light and delicate and come in a variety of flavours, and are so very European. Enjoy them with tea. I had not been to Soirette before but I did enjoy the two macarons that we sampled. I in particular liked the lemon flavoured macaron. Milestones Yaletown – Milestones surprised me with a Mexican styled breakfast taco. 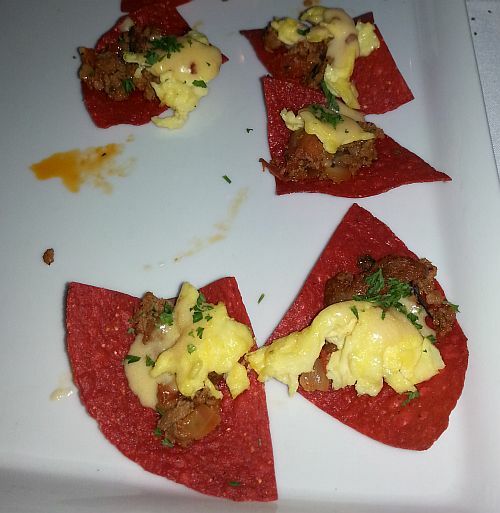 Each taco chip was topped with chorizo, scrambled egg, scallion and cheese. I do like Latin flavours and this one had the right amount of spice. Not sure if this, or something similar is on their regular menu. Chasers Fresh Juice – If a healthy lifestyle is something you aspire to, then visit Chasers Fresh Juice. 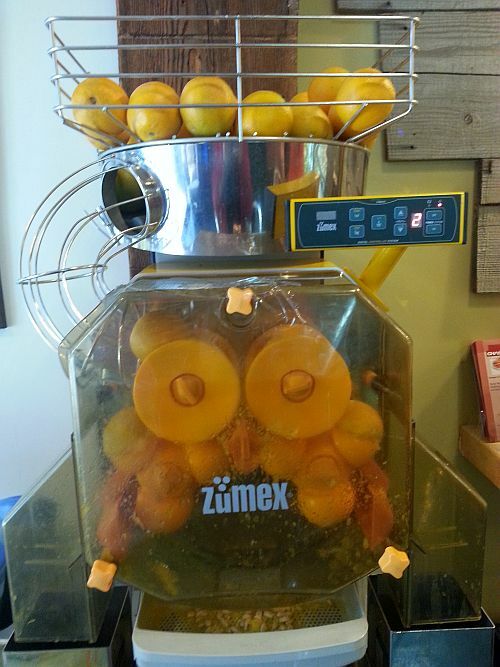 There you can get freshly squeezed orange juice, with the juice coming straight out of the juicer. They try to purchase as much local and organic ingredients as possible. They also have gluten free options. Besides juice they also have baked goods ( I didn’t check into this too much but I did notice it at the back). Being gluten sensitive, I was glad to hear I could have a nibble along with a sip of healthy juice. Marquis Wine Cellars – One of my long-standing favourite wine shops around Vancouver. Marquis has a wide selection of wines from around the world, and also supports our local BC wine industry. 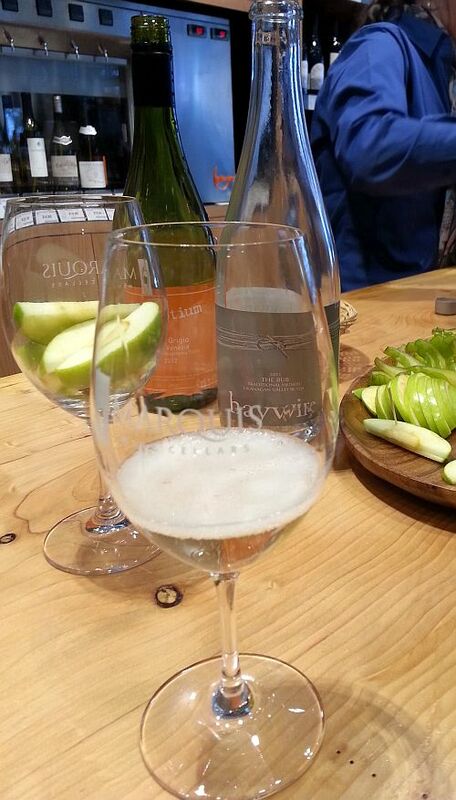 Today we had a chance to sample BC’s Haywire The Bub sparkling wine and nec-otium Pinot Grigio from Italy. I really enjoyed The Bub and had it paired with a slice of green apple. This entry was posted in Marqui Wine Cellars, pinot grigio, Vancouver, wine, wine tasting and tagged Bella Gelateria, chasers fresh juice, De Dutch Pannekoek House, Marquis Wine Cellars, Milestones Yaletown, Scavenger Hunt, Seventeen89 Restaurant, Soirette Macarons & Tea, The Parlour Restaurant, vancouver, Vancouver Foodster, xoxolat. Bookmark the permalink.